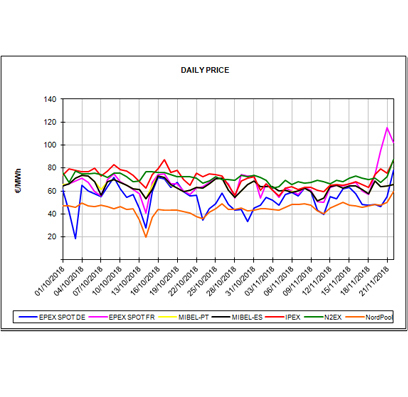 The drop of temperatures that Europe is experiencing this week pushed up the prices of the electricity markets. The impact has been greater in France, and especially in Belgium. 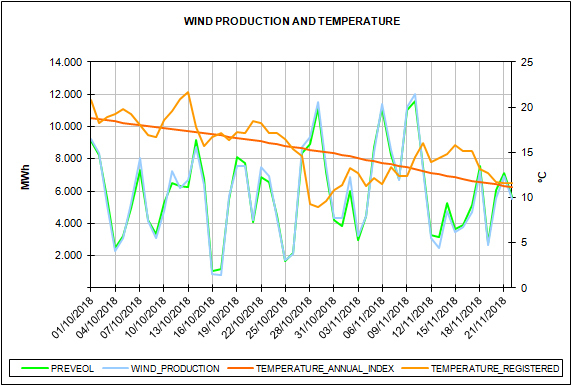 Both countries are in a serious situation of guarantee of supply if temperatures fall too low and demand picks up. In Belgium, only two of its seven nuclear reactors are available, and its nuclear production, which in winter normally accounts for half of the country’s total production, now accounts for only 25%. To fill the gap, the production of gas combined cycles has come to cover more than half of the country’s production, which according to the data available from AleaSoft since 2012, are values never before recorded. 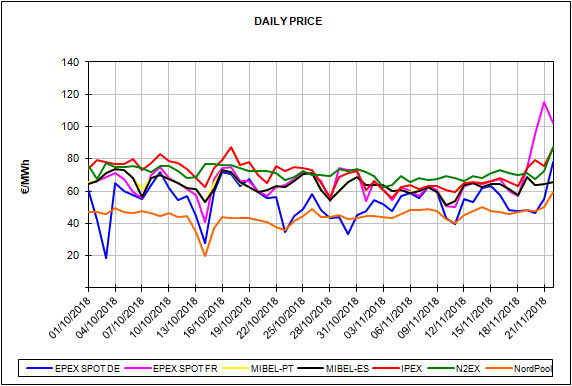 The prices registered in the Belgian electricity market this Wednesday, November 21, came very close to 500 €/MWh for the 19th hour, and with an average price of 244.86 €/MWh of the 24 hours of the day, the highest price since October 16, 2015. 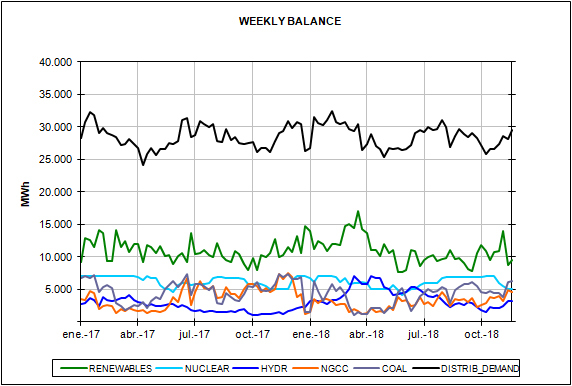 In France, the nuclear capacity is also reduced and, as it has been the case in recent winters, the security of supply is under threat for this winter if severe cold snaps arrive. In the French country, the average price for Wednesday November 21 was 115.13 €/MWh, the most expensive since January 24, 2017. And for hour 19, the hourly price reached 259.95 €/MWh. For the rest of the main European markets, Germany registered for today, November 22, its highest hourly price since January 25, 2017, 128.26 €/MWh, and an average price of the 24 hours of 77.80 €/MWh. 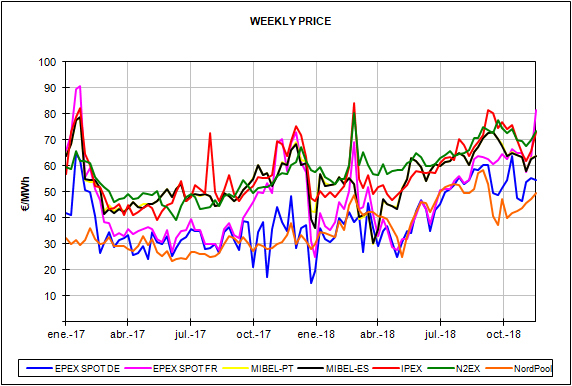 While the Iberian market, which in previous winters suffered with the French nuclear crises, this time contained its prices and even for Thursday, November 22, it registered the lowest price in the countries analysed by AleaSoft, € 65.89 / MWh, excluding NordPool, of course. The price of a barrel of Brent oil continues to sink due to the high rate of extraction, while the prospects for lower growth of the world economy suggest a decrease in demand. This week the price of the future for January has fallen by 4.1%, and since the maximum of this year in October, the fall is already 26.0%. European coal continues its bearish trend since October this year. 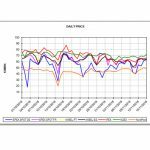 Yesterday, November 21, the future for January 2019 settled at $83.35 per ton, which already represents a decline of 18.6% from its 2018 peak value in October. Futures of CO2 emission rights continue at the same level as the previous week around 20 € per emitted ton. 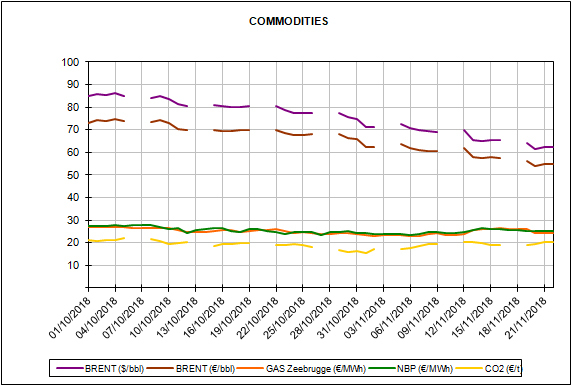 The price of gas futures recedes due to the forecasts of a less cold than expected December and the increase of stocks. 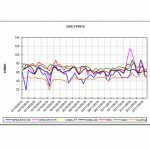 The values are at the level before the sudden rise of last week. The drop in the gas future for December this week has been 7.4%, and is once again below 25 €/MWh. The electricity futures have been dragged by the price of gas, and had a similar behaviour. 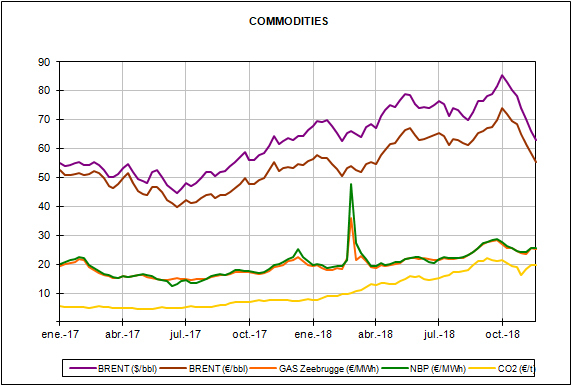 The price for December for Spain and Portugal has fallen this week by 4.8% and 4.9%, respectively, and for 2019, 1.4% in both countries. In France and Germany, the future of electricity for next month has dropped by 10.4% and 8.5%, respectively. 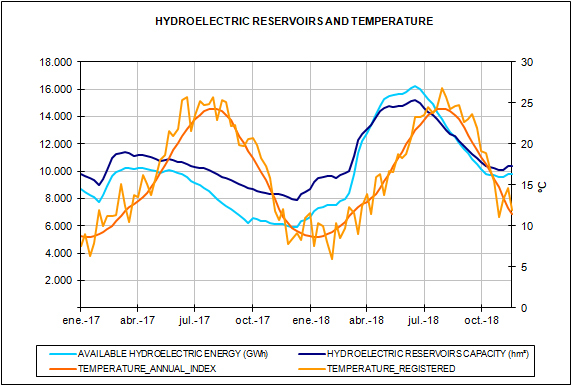 The drop of temperatures also reached the Iberian Peninsula. According to data from AleaSoft, the average temperature in Spain for this week can drop to more than 5.5°C compared to last week. 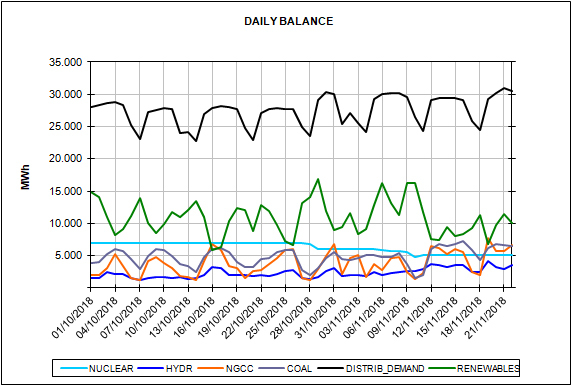 According to AleaSoft estimates, this will mean an increase in electricity demand of 3.4% in the total of the week. For next week, starting November 26, temperatures are expected to remain low, and AleaSoft forecasts indicate an additional 1.9% rise in demand.